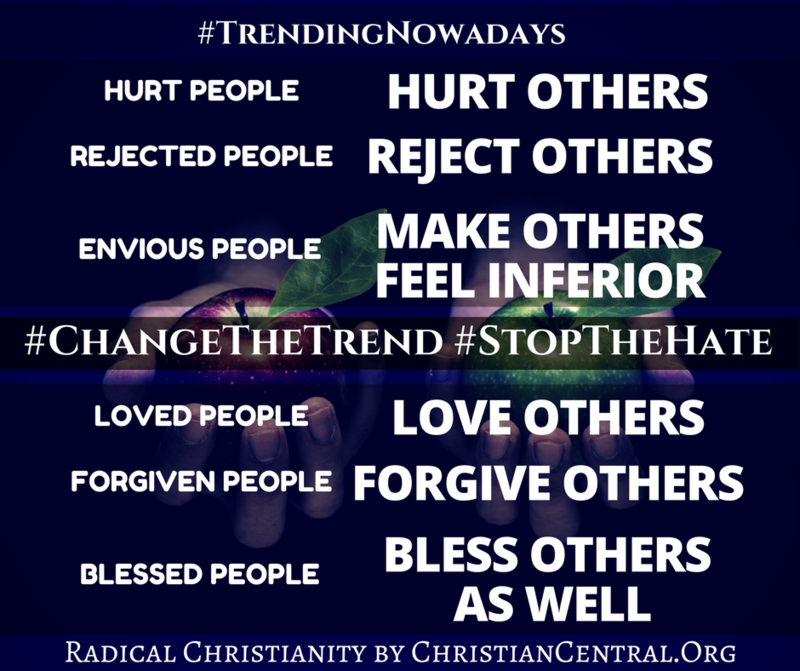 Change the trend Stop the Hate! Do we envy or hate other people for some reason? We should search our hearts and confess this sin to the Lord. It is God’s command that we owe no one anything except love. For it is with the love of God that we are also forgiven of our own sins. Let’s start our day by being a blessing to others. God favors the meek and the humble for He sees the heart of men. We have our own destiny and set of abundant blessings, so let’s be patient for God will reward us in time. If someone hates or envy us, let’s forgive them and pray for them. All the books of success stories center on positivity and good vibes. The reality is that we cannot sustain this positivity without love and forgiveness in our hearts. And we will not be able to continually forgive and love others if we do not see our own faults, and how a gracious God has continually forgiven and loved us through all these years. They say that we should “pay it forward”, but we should “give without ever expecting anything back”. It is better to expect from God than men, for God’s provision is not limited by human standards. You will be surprised at what God has in store for those who rely on Him. Just like the prodigal son story, mercy, undying love and forgiveness heals and changes people for the better. We should not store-up hatred or envy in our hearts! The devil will use this to destroy us one day. God will administer His justice, so let Him dispense it himself. Our forgiveness and kindness will reap a harvest of righteousness and changed lives for generations. We may not know that our neighbor, friend or that stranger is going through the toughest time of their lives. Our loving kindness may uplift and save them, or our wounding words may just destroy them. Choose the former and gain a lasting friend for ourselves.